Leonard Bernstein’s nephew explores the icon’s love for the city of Beethoven, Brahms and Mahler and how it helped him overcome Austria’s Nazi past. On the other side of the doors, another bas-relief plaque depicts an autograph on a musical score. The caption: “In this concert hall on May 28, 1948, the great director, composer and pianist made his Vienna debut.” In the elegant yet semi-legible signature, the honoree is Leonard Bernstein – arguably the most accomplished American-born music celebrity of the 20th century. Of all the renowned composers, interpreters and musicians who have left their mark on Vienna over the centuries, it might seem an odd choice to honor exclusively these two Jewish maestri – the former a native son who was shunned by Lueger era anti-Semitic Viennese society; the latter an exuberant New Yorker who through his Broadway musicals and television appearances became a worldwide celebrity. Still, the connection between Bernstein, Mahler and musical Vienna is worthy of a monument. None of these three can be defined today without mentioning the others. More than any other conductor, Bernstein is credited with reviving Mahler’s opus, through performances, broadcasts, recordings and films made with the Wiener Philharmoniker (Vienna Philharmonic Orchestra – VPO), who, as a result, atoned for their earlier wrongs against Mahler during his lifetime, if never quite shedding the history of their Nazi era shame. Through his Vienna recordings (and films of rehearsals), Bernstein’s interpretations continue to inspire today’s classical musicians. 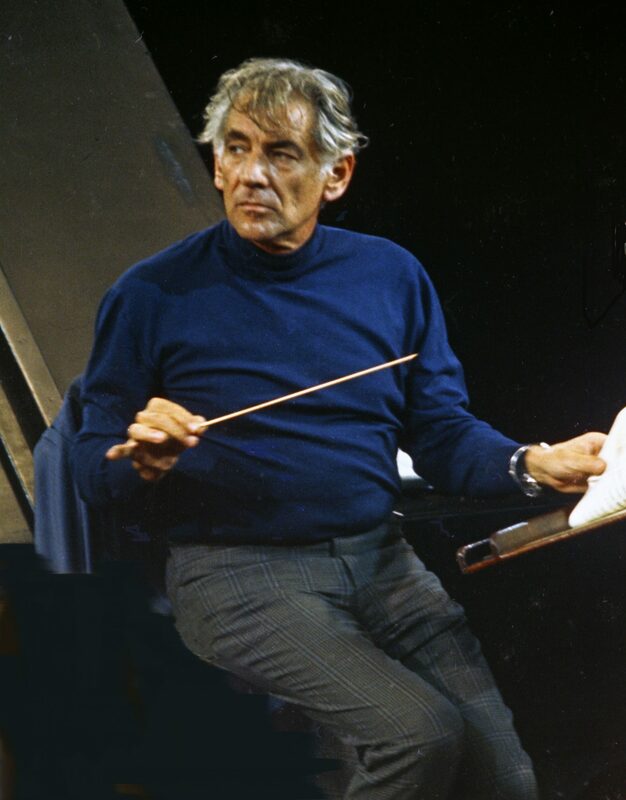 Bernstein’s 1948 debut in Vienna, however, was with Vienna’s other orchestra, the Wiener Symphoniker (VSO) – perhaps his protest against the Philharmonic’s expulsion of its Jewish members during the Third Reich. Only a few years after his legendary Carnegie Hall debut with the New York Philharmonic (when, on short notice, he stood in for the ailing Austrian conductor Bruno Walter), Bernstein bravely – or perhaps naively – risked his rising fame by stepping into the political intrigues of postwar Vienna. On the heels of his triumphant Bartók performance in Budapest, Bernstein was asked by the VSO to swap his own Jeremiah symphony on the planned program with a Bartók violin concerto. Apparently, they wanted to one-up the Philharmoniker, whose Bartók concert the previous week under Herbert von Karajan had been roundly booed. Bernstein resented being used as a pawn in a musical chess game. Writing home to his secretary, he said that Vienna was “a chauvinistic, provincial, nationalistic town, convinced that only Viennese can do anything, and that all Americans are fools … [I]t took me three rehearsals to overcome the natural hostility of the orchestra. But we made it! Love and music conquered all; and the concert turned out a great triumph.” Nevertheless, the deceit and hostility he encountered in Vienna and in Germany on that tour only fed into his own prejudice against these “Nazi” countries. It would be nearly two decades before he would return. Between his debut as a guest conductor and his death in 1990, Bernstein gave VPO concerts every year at the Konzerthaus or the Musikverein. Deutsche Grammophon issued recordings of their performances of every Beethoven, Brahms and Schumann symphony, as well as most of Mahler and dozens of other works by Mozart, Haydn, Ravel, Sibelius and Bernstein’s own work. He toured with the orchestra around Europe and North America, and led them at the Salzburg Festival five times. In 1982, the Philharmonic awarded Bernstein with its Ehrenring, a ring of honor symbolizing their “marriage.” Had Bernstein known that in 1966 Wobisch had secretly given an ersatz Ehnrenring to Baldur von Schirach, head of the Hitler Youth and Vienna’s Reich governor, upon his release from Spandau Prison, their relations might have been less collegial. Two years later, he bravely returned to conduct a new and far-from-traditional interpretation of Strauss’ der Rosenkavalier. “Every taxi driver in Vienna knows the score better than I do,” he claimed, with only a bit of false modesty. The New York Times called it “an act as daring as any since Daniel put his head in the lion’s den.” The performances, staged by the renowned Viennese director Otto Schenk, were acclaimed as “electrifying” (there were nearly 50 curtain calls at the premiere) and Bernstein was praised for rousing the Staatsoper from its Karajan-era doldrums, much as Mahler had done in his day. Earlier that year, the German-language production of Bernstein’s signature work, the musical West Side Story, premiered at Vienna’s Volksoper. Austrians were already familiar with the film version based on the Broadway original released years before. The production was a hit and would go into Volksoper repertory. With his successes at both opera houses and on the concert hall podiums, Bernstein became the talk of the town – the newspaper Die Presse wrote that he was now “an idol in Vienna for all time.” Newsweek magazine reported that a “Salute to Leonard Bernstein’ drew 6,500 saluters to the local sports arena. ”Having announced his imminent retirement as principal conductor of the New York Philharmonic, Bernstein was actively courted to take over the reins of the Staatsoper. Over the next two decades, the mutual love fest between Bernstein and Vienna only grew stronger. Nothing stood between him and his music making with the VPO, not even an earthquake that rocked Vienna on April 16, 1972 during a Sunday morning performance of Mahler’s Fifth at the Musikverein. Bernstein was reportedly so absorbed in the music that he didn’t stop conducting, even as the audience headed for the exits. 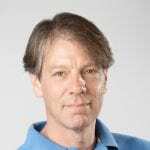 With enthusiasm bordering on religious fanaticism, those who bore witness to the Bernstein era in Vienna gush even today over his genius, his interpersonal rapport and Menschlichkeit. In his recently released biography Leonard Bernstein: Magier der Musik, Viennese author Michael Horowitz gathered several intimate recollections from Bernstein’s local collaborators, such as the diva Christa Ludwig and director Otto Schenk. Michael Barrett, Bernstein’s assistant conductor and protégé during those same years, recalls his mentor’s great respect for the Musikverein, the Theater an der Wien and all the places where “his forebears from Beethoven to Mahler had made music.” He also reminisces about the many “echt Wienerische things we shared: Ordering Tafelspitz with plenty of fresh Kren (horse radish) on the side. Sachertorte. Shopping at Loden Plankl, strolling through town amidst the caryatid-festooned K. und K. buildings. Visiting Heurigen (wine taverns).” Bernstein had clearly gone native. Aside from the Konzerthaus plaque, Vienna hasn’t done very much to officially memorialize its “idol for all time.” While Mahler’s name graces the street adjacent to the opera house that defined his reputation (for better or for worse), don’t look for Leonard-Bernstein-Strasse within the Ringstrasse – in fact, it’s an exit ramp tunnel off the A22 in Kaisermühlen. Of the 70 commemorative “stars” originally embedded in concrete along the “Musik Meile Wien” walk of fame in 2001, Bernstein’s – near Theater an der Wien – is currently one of the few remaining and is unlikely to survive the next street repair. A glass vitrine at the Haus der Musik exhibits Bernstein’s Frack (white-tie tails), which many doubt is authentic, due to its diminutive size. But yes, he really was that short – he just appeared larger than life on the podium. 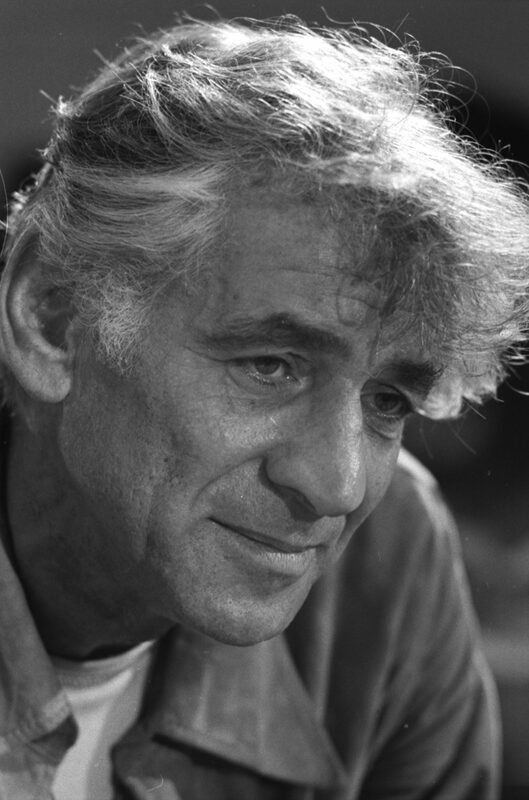 “Lenny” – as Bernstein was known by intimates and strangers alike – will turn 100 this coming year and his rich life and career are already being celebrated around the world. Vienna is certainly no exception – with a respectable number of events, exhibitions and concerts scheduled for the months to come. While Bernstein’s lasting legacy as a composer and conductor are all but assured, it is not so certain that his Viennese legacy will outlive such modest memorials. The generation who witnessed his magic first hand is gradually disappearing. His recordings with the Philharmonic are still popular, yet sooner or later these will be replaced by newer performances by contemporary conductors, recorded with state-of-the-art techniques. Unlike Mahler, Bernstein was a Wahlwiener – a Viennese by choice, you might say – not one of the city’s native sons. But then again, so was Beethoven.